Please Debbie –do not discourage individuals from praying the rosary for a plenary indulgence. We single people receive a plenary indulgence when we say the rosary in a church in front of the blessed sacrament…as well as in a pious group or family rosary. We must also receive Holy Communion on the same day, reject all sin in our lives and go to confession within 9 days, before or after. Single people can pray alone before the Blessed Sacrament and receive the indulgence. I am sorry for any confusion on this and I hope you now know we agree on this…:-) Have a beautiful and blessed weekend! Hi Debbie, I asked this question yesterday of the priest serving at 10:30 Mass in Stockbridge, MA at Eden Hill, National Shrine of Divine Mercy. He told me if there are other people in the church when we are praying our individual Rosary for an indulgence, one cannot recite out loud for fear of bothering someone else’s prayer. If it makes us feel better (and hopefully not to be scrupulous about it), we can form the words in our mouth without being vocal, to make it more public, but either way, he reminded me that ½ hour praying to Jesus in the Blessed Sacrament is also a Plenary Indulgence. There are so many ways we can receive a Plenary Indulgences we can do it daily, especially for the Holy Souls who count on us! WHAT an Awesome Church we have! Thanks, Debbie for mentioning indulgences. It is a sore topic for some of our separated brothers and sisters and because of it our teachers dropped the subject. How blessed we are to purchase with our time and effort from the OVER abundant merits of Jesus and His Mother, all the saints in heaven and united with our own sufferings. The Church helps us use ALL of it to benefit the Holy Souls and ourselves. We are all in this together. Regarding the merits of the saints and poor sinners, Jesus said, `I know your works: you are neither cold nor hot. Would that you were cold or hot! So, because you are lukewarm, and neither cold nor hot, I will spew you out of my mouth. For you say, I am rich, I have prospered, and I need nothing; not knowing that you are wretched, pitiable, poor, blind, and naked. Thank you, Father Calloway! I am completely blown over. I am on my 16th day of Fr. Michael Gaitley’s “33 Days to Morning Glory” and was needing a boost to continue this retreat, which will complete on August 15, The Assumption of Our Lady. My daughter’s name is Anne Marie and the feast of the Assumption is her birthday. I have returned to the church in my soul just recently and have never known much about the rosary or Our Lady until now. I am sure our Blessed Mother led me to this through EWTN to encourage me. 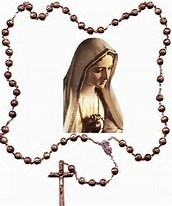 The rosary will be my sword. God Bless you. Thanks for having the link to Father Calloway’s talk, it was awesome. The Holy Spirit definitely led me here – I saw tomorrows topic on spouses helping each other get to heaven which was brought up in our couples prayer/ sharing group last Sunday evening and this months study is on prayer. Bless you.